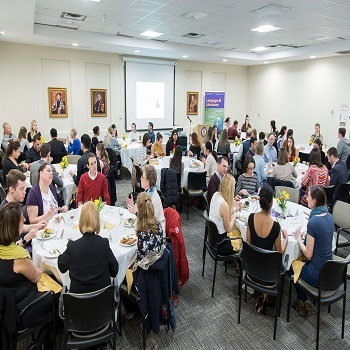 Alumni, faculty, staff and students braved the storm on April 4th to celebrate the 20-year anniversary of Languages and Literatures (L&L) at Laurier. The dinner reception took place in the Paul Martin Centre. The purpose of the get-together was to reconnect with former students, hear their successful stories and allow current students to get inspired. The testimonials that we heard bear witness to the fact that L&L graduates are making the best of their degree, in an impressive range and variety of careers. The alumni also express how their studies have propelled them to where they are and opened innumerable unexpected paths. Current L&L students made the most of this networking opportunity. In his opening remarks, the Dean of Arts gave voice to the sense of community for which Laurier is well reputed. The reception was made possible by the generous support of Laurier Alumni and the Faculty of Arts.